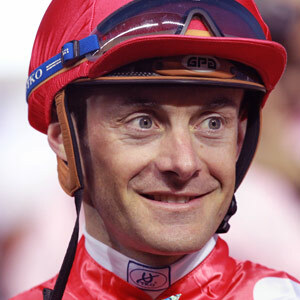 One of the most sought-after and accomplished big-race jockeys of the modern era, Olivier Peslier has tasted glory on a whole host of top class horses all over the world. Leading the way are his three Breeders’ Cup Mile victories in the USA on the mighty French mare, Goldikova. He has also won a stack of big races in Japan, Hong Kong, Canada, Germany, Britain and, of course, his native France where he has been champion jockey four times and won most of the country’s top races numerous times, including four Prix de l’Arc de Triomphes, most recently on Solemia in 2012. He stole the headlines at Ascot in 2010, winning the Queen Anne Stakes (now one of the key mile races in the QIPCO British Champions Series) on Goldikova at the royal meeting in June and the King George VI and Queen Elizabeth Stakes (now a pivotal race in the middle-distance category of the QIPCO British Champions Series) in electrifying style on Harbinger in July. He made the mighty Frankel work hard in the final race of the 2012 QIPCO British Champions Series when riding the defending champion, Cirrus Des Aigles, into second place in the QIPCO Champion Stakes. He won four Group 1 races in France in 2013, most notably the Prix du Jockey Club (French Derby) aboard Intello. In the 2014 Series, he rode Rizeena into second place in the QIPCO Falmouth Stakes and then bettered that by winning the Queen Elizabeth II Stakes on Charm Spirit, his first Series victory. Brought up in Mayenne region of France, he started pony riding at a very young age. He is currently the retained jockey to the Wertheimers, owners of the now retired Goldikova. He is an avid fan of paintball and a good friend of Frankie Dettori.